Care practices and risk factors for diarrhea among impoverished communities across Mesoamerica are unknown. 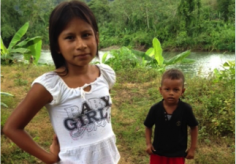 Using Salud Mesoamérica Initiative baseline data, collected 2011–2013, we assessed the prevalence of diarrhea, adherence to evidence-based treatment guidelines, and potential diarrhea correlates in poor and indigenous communities across Mesoamerica. This study surveyed 14,500 children under 5 years of age in poor areas of El Salvador, Guatemala, Mexico (Chiapas State), Nicaragua, and Panama. We compared diarrhea prevalence and treatment modalities using χ2 tests and used multivariable Poisson regression models to calculate adjusted risk ratios (aRRs) and 95% confidence intervals (CIs) for potential correlates of diarrhea. The two-week point prevalence of diarrhea was 13% overall, with significant differences between countries (P < 0.05). Approximately one-third of diarrheal children were given oral rehydration solution and less than 3% were given zinc. Approximately 18% were given much less to drink than usual or nothing to drink at all. Antimotility medication was given to 17% of diarrheal children, while antibiotics were inappropriately given to 36%. In a multivariable regression model, compared with children 0–5 months, those 6–23 months had a 49% increased risk for diarrhea (aRR = 1.49, 95% CI = 1.15, 1.95). Our results call for programs to examine and remedy low adherence to evidence-based treatment guidelines.